How simply and candidly it adumbrates the complete idea behind IndiaMART- “Kaam Yahin Banta Hai”. Yes, in the glitz and glamour world, where positioning happens through elegant and captivating imageries, IndiaMART comes up with its drop-head Ad relaunch with a coherent message brought to light in an extremely simplistic fashion appealing to the masses. We all have heard of this recent craze about ‘selfie’ all over on social media. So, how about clubbing it with a better creative idea? 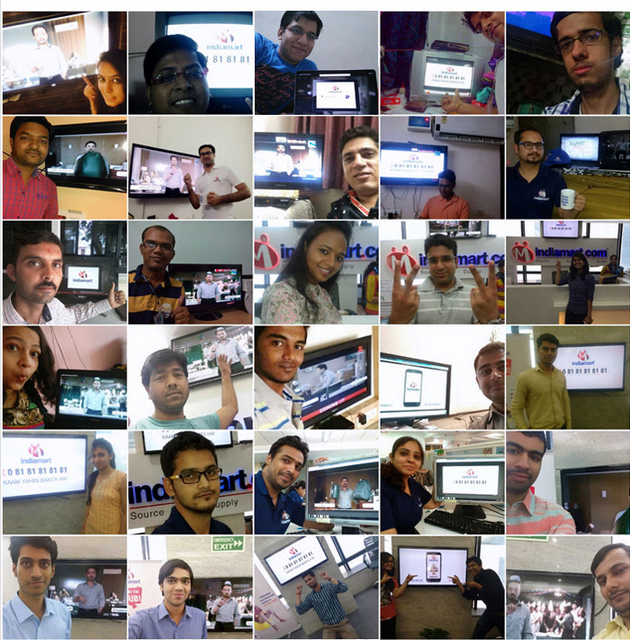 How about a ‘tel-fie’- clicking a selfie with a TV. When the idea of organizing this quirky contest was integrated with IndiaMART’s recent brand’s core campaign, there was clapper all around. This contest idea inspired from ‘selfie’, was aimed at using the literal and figurative meaning of pictures, that draws people in, tell a story, and communicate information in the most effective and creative expression…This complete idea of capturing the selfies with the IM Ad played in the background, was designed to convert the experience into a delightful one, yet communicating the idea of the brand campaign. Posts, comments and flood of entries from employees were pouring in from twitter, facebook, whatsapp and other social networking channels, even on the weekends! Innovative clicks with the IndiaMART Ad in the background during the screening of the Movie PK, to this being subsequently tagged with India Vs Bangladesh match and other popular daily shows, the activity was extremely well collaborated with the Ad campaign and received humongous response. This Telfie fever was contagious and it got better, much better. So much better, in fact, that it developed a startlingly committed fanbase and response. When most companies are blocking employee access to social media networks, IndiaMart is going to the other extreme and encouraging its staff to communicate and adopt more social media channels which is well reflected in the Telfie Contest and even previous hit engagements such as Dubsmash and Selfie contests. Adding more fun and creativity to this vibrant campaign, were a slew of other activities like IM Bus branding roll-up. The entire office was decked with posters, danglers and standees of the new TVC launched. Cheers to the acumen of organizers and the participants.